Poems in the Waiting Room makes available short free collections of poems as cards for patients to read while waiting to see their doctor, and to take away with them. There is no charge to the patient or to the NHS. We publish both well-known and new poetry, approved by a practicing psychotherapist to promote well-being. The pocket sized cards are distributed four times each year in bundles of twenty. 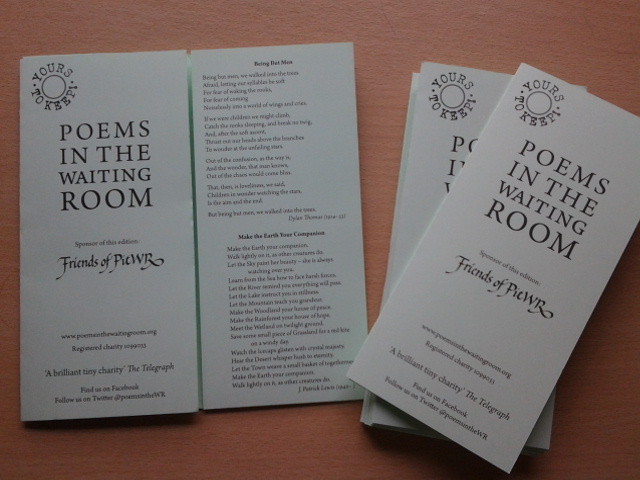 Each card provides some seven or eight poems. ﻿﻿Patients - Join the Friends of PitWR and support your NHS waiting room. NHS doctors and practice managers - Sign up to receive our cards for your waiting room. Poets - Submit a poem you have written, or suggest one we should use.